This shot can be seen the in video "Electric Rails Around the Bay". This is actually at 41st & Shafter. The train is headed Eastbound out of the yard at 40th & Shafter. This picture was taken from the South side of 41st looking toward Shafter and Opal at the far end of the block. The train is bypassing the yard lead and heading toward 40th and points West. The yard is out of the picture to the right on the far side of Shafter. The train is on Shafter heading south while crossing 41st. 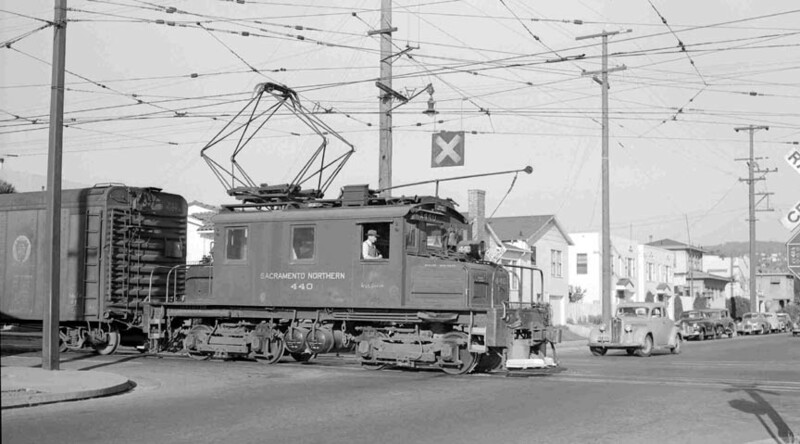 The photo location is in question due to the point that the S.N.leased #440 & #442 to the Oakland Terminal Ry. as well as finding the reflector studded stop sign to the right that looks more like a spot on the Key System unless it is known that such a thing was on the R-O-W of the S.N. I was just there last week taking photos. This train is definitely heading south on Shafter and just crossing 41st street. The buildings in the background are still there. You can even see them on Google Earth/Maps.